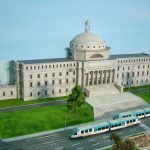 Banco Popular – SMARTT: Scale Models, Arts, & Technologies, inc.
A new light-rail tram service for San Juan, similar to that in Barcelona, Spain, is a proposal being actively promoted by Banco Popular as a means to ease traffic congestion, as well as air and noise pollution, particularly in the historic district of old San Juan. A central part of this effort is the dynamic HO scale layout featuring the proposed new trams operating throughout a replica of much of the downtown area. This exciting display includes the most memorable sights and sounds of the city. The layout, known as “On Rails: Another Way of Moving in Old San Juan”, was commissioned by Banco Popular, and it is located in their historic Art Deco head office building in Old San Juan, where it is on public display. The rest of the exhibit was designed by Estudio Interlinea of Puert Rico. By helping to bring this proposed project to life, this scale model is playing a key dual role. It is making visitors aware of the transportation challenges facing San Juan by proposing this viable solution for the city’s well-being and future. And, it is helping to generate interest for corporate sponsorship and public financing to support effective urban planning incorporating this mass transit solution as a means to improve the quality of life in this central urban environment. The two key structures of the layout are the distinctive Banco Popular headquarters and the Old San Juan Capitol Building. Many other local favorites are also reproduced. Famous parks, government buildings, plazas, castles, and hotels all find a home here in miniature. When the lights dim down every ten minutes or so, the buildings and streets take on a life of their own with hundreds of sparkling lights, while the sky backdrop shows off a multitude of twinkling stars. In the background, the unique tree frogs (“coqui”) native to Puerto Rico, croak happily. SMARTT accomplished all this using photos of the real locations together with satellite imaging for reference data. Here’s what our client has to say . . . .
Dimensions: 6 ft x 38 ft Island layout accessible from three sides. Tram activates voice circuits at various station stops.